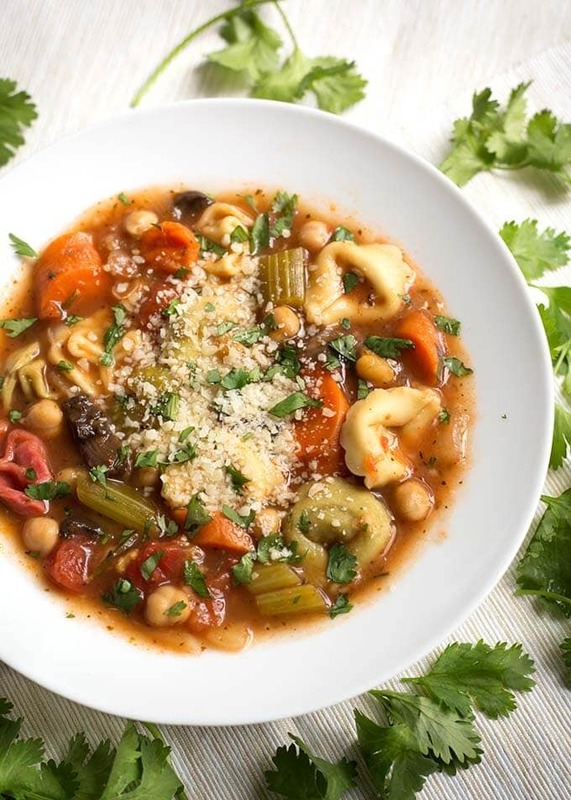 Instant Pot Vegetable Tortellini Soup is delicious, vegetarian, and full of healthy veggies in a rich and flavorful broth. The cheese tortellini has a nice texture. 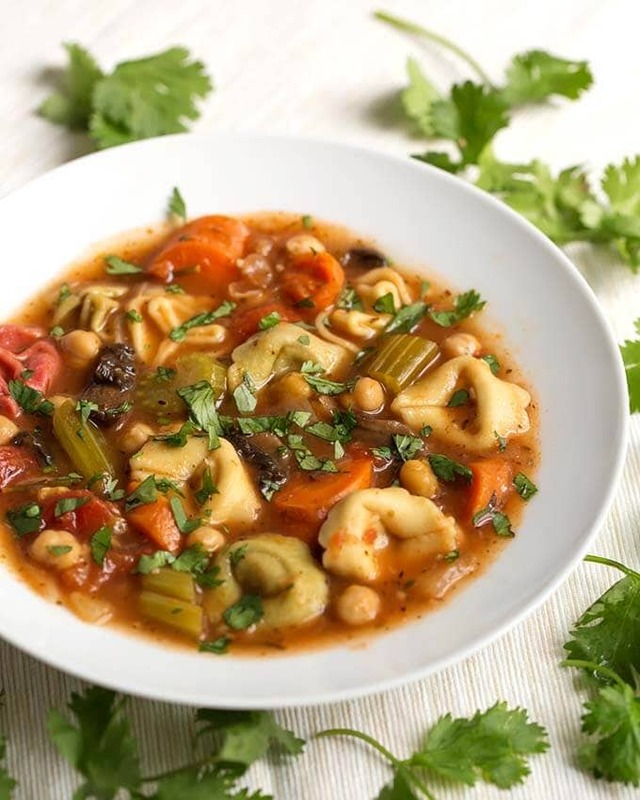 This pressure cooker vegetable tortellini soup is a vegetarian delight! Today I’m bringing you another Instant Pot soup recipe. A simple, healthy vegetarian soup! Instant Pot Vegetable Tortellini Soup is what I like to call a “light comfort food”. 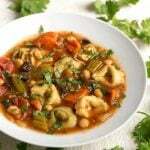 This soup packs a lot of nutrition, due to the many vegetables, and is low in fat. The tortellini make it more filling. You could even omit the tortellini and replace it with meat for a low carb or gluten-free version, if you wish. It’s a very versatile soup recipe! I love making soup in the Instant Pot, and hardly ever make it on the stove top these days. I find it is much faster, in most cases, and the pressure really brings out the flavors. A one-pot meal is always a good thing! If you are a soup lover like me, and want some other Instant Pot soup recipes, just type the word “soup” in the search bar in the menu at the top of this web page. A few of the vegetarian soup options are Instant Pot Fresh Corn Soup, Instant Pot Minestrone Soup, and Instant Pot Sweet Potato Kale Soup. Many of my other Instant Pot soup recipes can also be made vegetarian by simply swapping chicken broth for veggie broth, and omitting the meat! 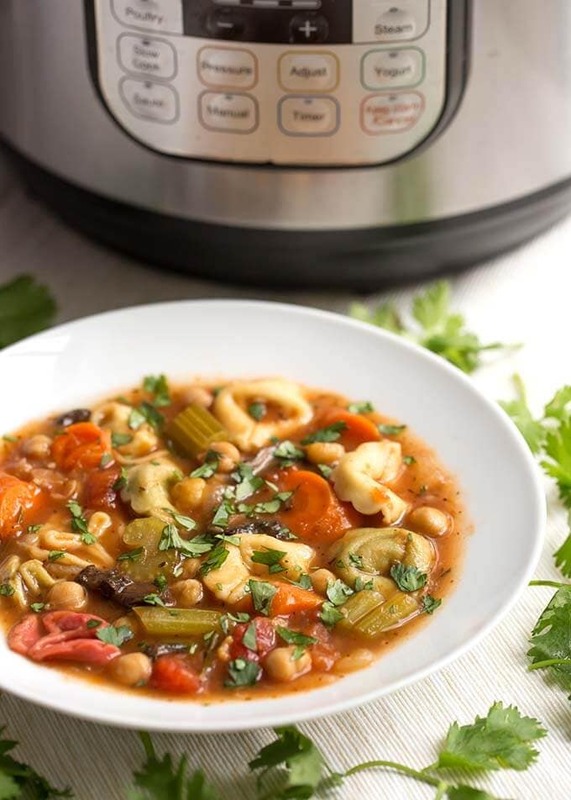 Instant Pot Vegetable Tortellini Soup is a vegetarian delight! 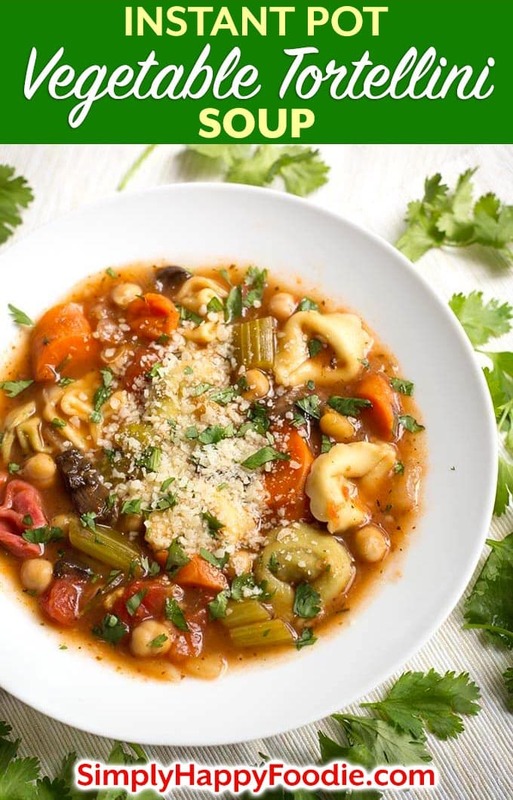 This Vegetable Tortellini Soup is full of healthy veggies in a rich and flavorful broth. The cheese tortellini has a nice texture. 4 cloves Garlic, pressed or finely minced. Turn on the Sauté function. When display reads “Hot” add the oil. Add onions, carrots, celery, and bay leaf. Cook until vegetables are tender, stirring occasionally. Add the tomatoes, thyme, Italian seasoning, salt, pepper, and rosemary. Stir. Add the broth, garbanzo beans, mushrooms, zucchini, and tortellini. Stir. Place the lid on the pot and set the Steam Release Knob to Sealing (not on Ultra). Press the Pressure Cook (or Manual) Button, or dial on Ultra. Set time to 3 minutes using the + or - button, or dial. When cook cycle ends, let pot naturally release pressure for 5 minutes. Then manually release the remaining pressure by turning the knob to Venting (or push the button on the Ultra). When the pin in the lid drops down, open the lid and stir the soup. Taste and adjust salt, if needed. If using, stir in the baby spinach leaves and let them sit a minute to wilt in the hot soup. Garnish with chopped fresh basil leaves and parmesan cheese. dried version, which takes longer to cook. I don’t use the dried, I think it would need too much time and the veggies would get too soft. Frozen would also work. We loved this soup! Even my boyfriend who is a picky eater liked it. I froze the leftovers. This might be good with a spoonful of pesto added. That’s great, Cora! Thank you for your review. I think some pesto would be nice. Thank you, I’ve corrected it. Just got our instant pot and this is one of the first recipes we made, it is a keeper! Didn’t change a thing. Thanks! Five stars for sure. That’s great, Jim! Thank you. I’m happy that you liked it! Tortellini frozen when you add them or thawed? Either refrigerated or frozen will work.